Initiation aux couleurs et à leur mélange. I knew this book from the English version and was thrilled to read it in French. 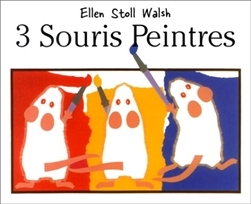 Easy and fun, the three mice walk into colors and go from Red to Yellow to create Orange and so on. Easy, entertaining way to talk about colors.